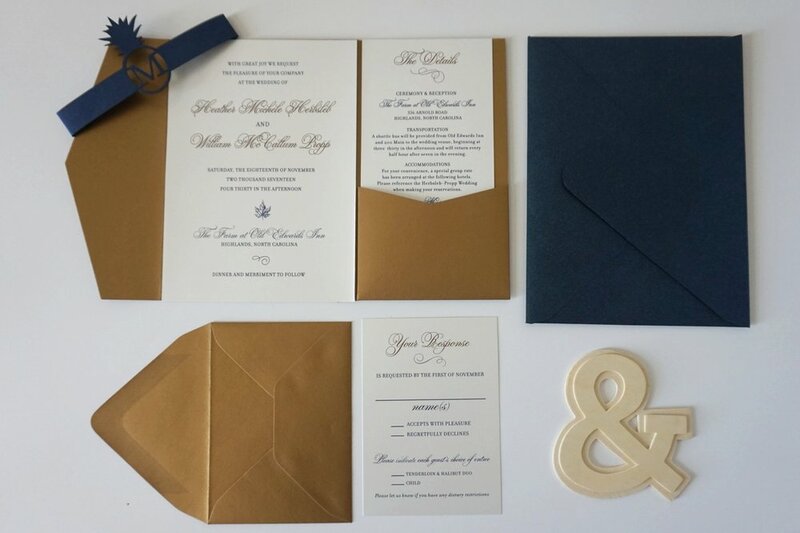 Here are beautifully designed wedding stationery suites that are perfect for your Palmetto State wedding. Many of these South Carolina wedding invitations are produced by artists local to the state, and all are created by small design businesses. This stationery suite from Paper Whites Press is the ultimate in South Carolina wedding invitations: the palmetto tree icon and the navy and white color scheme invokes the South Carolina flag (in the best way possible) while creating a clean, chic look. The orientation of the printing on the paper creates a modern aesthetic, while the border has intricate detailing that is reminiscent of the Edwardian era. The designer, Sarah Litty, also offers these in ecru with different colored trees so you could customize them to your wedding theme. You can coordinate every portion of your stationery suite with this set from table markers to save the dates to thank you notes! View the invitations on Paperwhites Press here. 2. State of South Carolina Invitation from Penelope's Paper Pantry. What part of South Carolina has your heart? The answer is easy to see with this bold and inventive invitation. The rustic wood grain background would be fantastic for an event held on a country estate or a barn, while the white letter pops against the dark blue base. The matching RSVP card matches perfectly and has room for all of the essential details you'll need from your guests. View Penelope's Paper Pantry's shop here. Few things evoke the romantic side of South Carolina like a centuries old oak tree dripping in Spanish Moss. This stunning invitation captures the graceful natural beauty of the oak and combines the line drawing with vintage detailing such as an antique map of your ceremony location and a black and white photo of your destination city. Feel the romantic of a South Carolina wedding with these stunning invitations! Backed with a serene photo of a live oak tree, magnolias and a pond, the invitation brings to mind sweet spring breezes and long garden strolls with your better half. The pink detailing, monogram header, and classic fonts complete this sweet suite. Check even more invites from Factory made here. A symbol of Southern hospitality sounds like the perfect thing to put on a wedding invitation. Show your guests how much you're excited to share your big day with them by sending this beautiful invitation suite. It's bound together by a laser cut belly band and features your custom monogram. Sofia Sayer, the designer, is a Greenville resident, so you'll be able to showcase some local South Carolina talent with these as well. View Sofia Invitations' website here, and get more inspiration on her Facebook and Instagram accounts. The Reedy River and Greenville's downtown area are so gorgeous that it's no surprise that they've found their way onto a wedding invitation. With bold modern fonts and a delicate pen-and-ink drawing of Greenville, this unique invitation suite will wow your guests before they set foot in your ceremony space. View Magic Wand Weddings' shop here. This clean, crisp layered invite was inspired by the designer's favorite memories of Hilton Head vacations. Whether you're planning an event at Harbour Island or elsewhere in the Hilton Head area, you can't go wrong with the simplicity and elegance of this beautiful pocketfold set. View Harmony Design's shop here. Your Soda City nuptials should celebrate the best that Columbia has to offer, and this colorful invitation delivers. With the ability to customize tones to your specific wedding scheme and a variety of fonts to choose from, designer Kerry Dickson can create exactly what you need. The standard invitation suite includes an invitation, details card, reception card, and an RSVP card, but other coordinating pieces can also be created especially for you. View Weditorial Design's shop here. 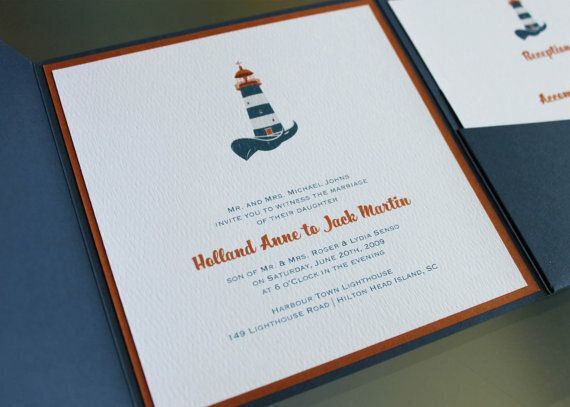 Of these South Carolina wedding invitations, which do you like the best?